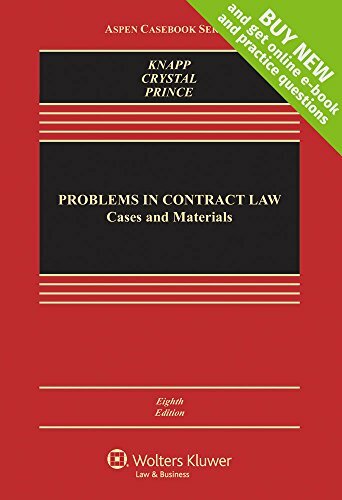 Problems in Contract Law: Cases and Materials, offers a balance of traditional and contemporary cases that reflect the development and complexity of contract law. Explanatory notes and text place classic and contemporary cases in their larger legal context. Questions and problem exercises bridge theory and practice. Adaptable for instructors with different teaching techniques, this successful book includes various perspectives and contractual settings and offers a highly intelligent, contemporary treatment of contract law. It can easily be used in teaching by traditional case analysis, through problem-based instruction, or using theoretical inquiry. Addition of more than 60 review questions with detailed answers that provide the reasoning behind the correct answer and explain why the other choices are incorrect. Quiz yourself before class and prep for your exam in the Study Center. Practice questions from Examples & Explanations, Emanuel Law Outlines, Emanuel Law in a Flash flashcards, and other best-selling study aid series help you study for exams while tracking your strengths and weaknesses to help optimize your study time.